General Electric Company (GE) is a diversified industrial corporation, and operations include engines, military, wind turbines, locomotives, lighting and financial services. GE is one of the leading lighting companies in the world. GE had an active OLED lighting program, collaborating with Tokki and Konica-Minolta on roll-to-roll printing of OLEDs and in 2008 GE announced they will stop working on incandescent lamps and focus only on LED and OLEDs. GE did not update on their OLED Program since 2010, though. 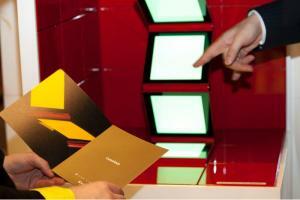 Konica Minolta will unveil new flexible OLED lighting panels at the Lighting Fair 2013 exhibition in Tokyo next month (March 5). Their flexible OLEDs will debut in a "variety of forms", and visitors to KM's booth will be able to experience those new panels. We do not have any more information yet - hopefully KM will give technical details soon (or during the exhibition). Back in 2010 KM (together with GE) unveiled flexible OLED panel prototypes, but it seems that now the company is set to actually releasing products. The 2010 prototypes achieved 56 lm/W (and "commercially viable lifetime") using soluble materials in a roll-to-roll process. In 2010 the companies announced plans to produce those panels in 2011, but obviously this never happened. We're not sure if GE is involved in these new panels. Nanomarkets posted an interesting article discussing what a low-growth world means for OLED lighting. They say that while OLEDs has been touted as a high-efficiency lighting technology, this feature alone will not be enough to gain real market share in the lighting industry as the developed world is experience difficult financial times. 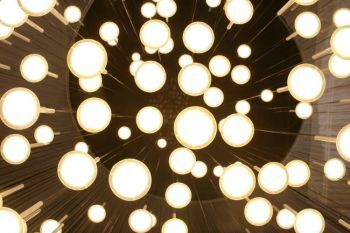 There are still technology challenges that needs to be overcome, and companies need to commit to mass production before OLED lighting will begin to sale in meaningful quantities. Nanomarkets also laments the lack of industry leadership - they hoped that GE will be the leader, but it seems that their solution-processable OLED approach is not advancing as everybody hoped, and other companies aren't talking about mass production yet. It seems clear that it'll take at least 3-4 years for the OLED lighting market to actually emerge. Back in February, Pioneer and Mitsubishi Chemical has announced an OLED Lighting JV. Pioneer will produce OLED lighting panels, Mitsubishi Chemical will supply chemicals and will market and sell the panels through their Verbatim daughter company. We had the good chance to speak with Verbatim regarding this new OLED business. Q: Are there any updates on the OLED JV? Mitsubishi Chemical Corp will start to supply samples at the end of 2010, and mass production in the middle of 2011. Konica-Minolta to start making flexible OLEDs in 2010? 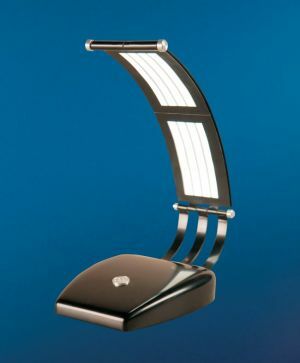 OLEDNet reports the Konica-Minolta plans to start mass production of flexible OLED lighting panels in 2010. Konica-Minolta is cooperating with GE on manufacturing technology. According to the report, Konica Minolta is using polymer materials and printing technologies. The materials are made by Sumitomo. The lifetime of Konica-Minolta’s products is estimated to be 3,000 hours or more with the brightness of 1,000 cd/m2. We think that this is a bit optimistic... according to KM's own plans, the first plant is scheduled for March 2011. Just last month they re-iterated their plans to start making the flexible OLEDs in 2011, and we do not think this will qualify as 'mass production'. We also know that KM is using UDC's Small-Molecule Phosphorescent materials, but maybe they are also working with Sumitomo on Polymer based OLEDs. GE and Konica Minolta announced that they have achieved a "major breakthrough" in their white OLEDs: an efficient 56Lm/w flexible white OLED that is made using solution-coatable materials in a roll-to-roll printing process. The materials have "commercially viable lifetime" (we do not know exactly what they mean by that). 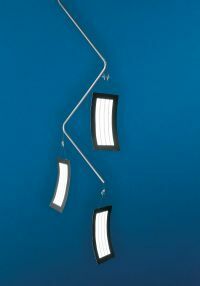 GE and Konica Minolta plan to introduce their flexible OLED lighting products next year (2011), and have already displayed some early prototype lamps (one of which is shown above). They are working together since 2007. KM hopes to see $1 billion in OLED Lighting sales by 2018. KM has licensed OLED IP from UDC. GE and Konica Minolta is showing new lamps which use flexible white OLEDs. There are several "configurations" (or designs, really) which include desk lamps and ceiling lamps.We do not have any technical details on those panels yet. We already know that GE plans to start printing OLED Lighting panels in 2010. Now Anil Duggal, GE's OLED lighting printing group leader, says that they know that those pilot panels will be very expensive. He hopes that by 2015, it'll be possible to print OLED panels that will be both cheap and efficient. GE has recently received $4 million from the DOE to upgrade their pre-pilot roll-to-roll manufacturing lines (the whole project will require $8 million). Cambrios got $1.2 million (out of $1.8 for the total project) for "Solution-Processable Transparent Conductive Hole Injection Electrode OLED SSL". This project seeks to develop a cost-effective replacement for indium tin oxide for use as an electrode in OLED lighting devices. Indium is both rare and very expensive. The University of Rocherser got $1.2 million (out of $1.3 million) for "Development and Utilization of Host Materials for White Phosphorescent OLEDs". This project seeks to produce white OLEDs with > 100 lm/W efficiency after light extraction enhancement and > 10,000 hour operating time, by making a new class of emissive materials. PPG Industries got $1.6 million (out of $2.1 million) for "Low-Cost Integrated Substrate for OLED Lighting". PPG Industries plans to develop a new low-cost integrated substrate product that is suitable for OLED lighting manufacture and is compatible with PPG’s existing flat-glass and transparent-glass coating technologies and high-volume glass manufacturing methods. GE Global Research got $4 million (out of $8 million) for "Roll-to-Roll Solution-Processable Small-Molecule OLEDs". This project seeks to upgrade GE’s prepilot OLED roll-to-roll manufacturing line through improved high-performance phosphorescent small-molecule OLED materials, advanced OLED device architectures, plastic ultra-high barrier films, and an advanced encapsulation scheme. UDC got $4 million (out of $8.3 million) for "Creation of a U.S. Phosphorescent OLED Lighting Panel Manufacturing Facility". This project seeks to design and set up two pilot phosphorescent OLED (PHOLED) manufacturing lines. The team will implement UDC's PHOLED technology and provide prototype lighting panels to U.S. luminaire manufacturers to incorporate into products, to facilitate testing of design, and to gauge customer acceptance. Interestingly, two of these project (the GE and UDC ones) involves actual OLED Lighting panels pilot production lines - which could lead to actual OLED products being commercially available. GE and Israel's Power Paper will jointly-develop self-powered (battery) OLED Lighting. The project will combine Power Paper's paper-thin, flexible batteries with GE's OLEDs. GE says that the new OLED products will cost less, be more effective and will be reliable and shock-resistant.